Across Texas, city councils are beginning to take the regulation of payday and auto title lenders into their own hands. But lobbyists have also been active in opposing municipal ordinances. Across Texas, city councils are taking the regulation of payday and auto title lenders into their own hands. But lobbyists, who were instrumental in blocking some far-reaching state legislation on lender regulations last year, have also been active in opposing municipal ordinances. In Dallas, Austin, San Antonio, Brownsville, Irving, Mesquite, Sachse, Richardson, Garland and Little Elm, city governments have passed zoning ordinances to limit the expansion of payday lending businesses in their cities. The ordinances come on the heels of 2011 regulations passed by the Legislature, which some city councils felt were not comprehensive enough. The recent state laws require payday and auto title lenders to be regulated by the state and to post a schedule of fees in visible places in their businesses, similar to the overhead menus in fast-food restaurants. Critics say that the short-term, high-interest loans by such lenders has led thousands of Texans into a cycle of debt and dependency. “In Dallas and Austin, we are leading the fight at the local level, because the state has been hindered by the significant lobbying effort that the industry has taken on,” said Barksdale English, a policy aide for Austin City Councilman Bill Spelman, who authored a recently approved zoning ordinance that limits where payday and auto title loan businesses can be located. Armbrust & Brown did not return calls seeking comment. 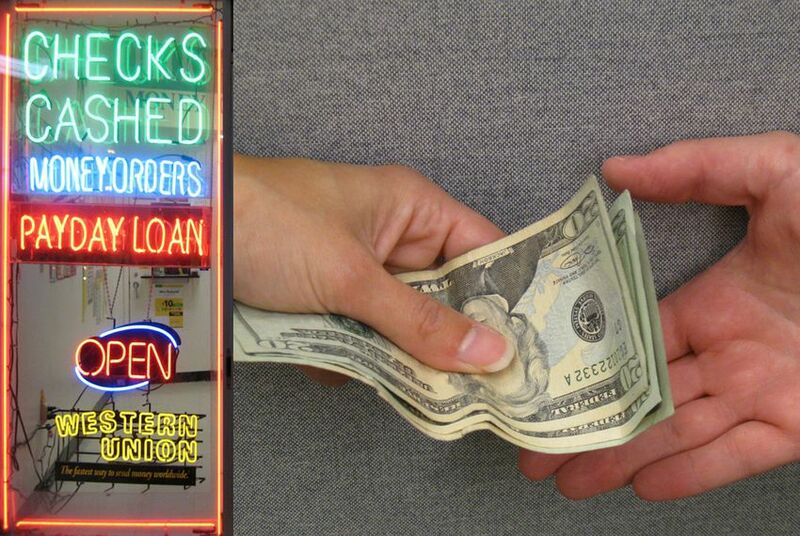 Payday lending is banned in 12 states. Some states cap the maximum loan amount, but in Texas, it is unlimited. The Texas Constitution says annual rates of interest of more than 10 percent are illegal. However, this constitutional protection can be bypassed if payday lenders register their businesses as “credit service organizations,” which under state law are defined as organizations that improve a consumer’s credit history or rating, or obtain an extension of consumer credit for their clients. Some payday and auto title loan companies charge interest rates of up to 500 percent. Last year, the city of Dallas passed an ordinance that required payday and auto title lenders to register with the city, and restricted the amount of loans that can be extended and the terms of repayment. The Consumer Service Alliance of Texas filed a lawsuit in response. CSAT said the ordinance conflicted with state law and limited credit access for Dallas residents. The association also filed a similar lawsuit against the city of Austin for a different payday-lending ordinance, which capped the maximum loan amount and restricted the number of times a payday loan can be refinanced. Both lawsuits are still in litigation. The city ordinances are meant to prevent situations such as the one faced by Lucille Florez, an Austin woman who took out an auto title loan of about $2,500 to pay for the funeral expenses of her husband and daughter. Florez assumed she could make monthly payments, not realizing she would have to pay the loan and fees within 30 days or roll the balance over into a new loan. Over four months, she ended up with $3,100 in debt. However, some Texans say payday loans are an important resource for lower-income individuals who do not have access to traditional bank loans. At a City Council meeting last Thursday, Austin resident Manny Camero said payday loans have helped him manage emergency financial situations. State law allows borrowers to cancel their loans within three days, and so Camero has taken out small loans a few days before receiving his next paycheck, and repaid them before interest rates took effect. The issue has gotten the attention of several statewide religious organizations, including the Texas Catholic Conference, the Texas Baptist Christian Life Commission and Texas Impact, which have spoken out on the issue and formed a statewide coalition called Texas Faith for Fair Lending. Last year, Bishop Joe Vasquez of the Catholic Diocese of Austin testified that nearly 20 percent of the people assisted by his diocese’s charity division sought help for debt resulting from payday and auto title loans. In 2010, he said, his diocese provided about $1 million of assistance to these individuals. For now, the recent city ordinances remain in place. But Bennett Sandlin, executive director of the Texas Municipal League, said it's possible that the ordinances could be pre-empted by the Legislature next year. "We're hearing that it's possible that some people would like to ban municipal ordinances on payday lending, and it's possible that legislation will be filed to that effect in 2013," Sandlin said.